Professional terms and conditions for an individual or company caterer, providing a standard form of quotation detailing the client's precise requirements. Ideal for use for weddings, parties, corporate functions and all other events. This is a very flexible document. 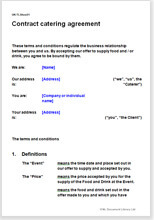 It can be used as a standard “terms and conditions” document for either a single assignment or an ongoing contract. All it needs is the addition, by reference, of a quotation providing all the information particular to the contract in hand. This document can be used either as the basis for negotiation or as a "terms and conditions" document when it will be put to a client on a "take-it-or-leave-it" basis before the contract is formed. Do not risk your clients blaming you for matters beyond your control or as a result of a misunderstanding. Perhaps you have only small jobs or repeat customers who you don’t want to upset. But you must get the contract terms in writing so your work will progress smoothly. A Caterer using this document may well find a good selling point in the provision of insurance and consequent acceptance of full liability.